New to beauty boxes, I’m in the honeymoon phase of our relationship and all a swoon. To be specific, I love my Birch Box. Birchbox, arguably the most recognizable service today, put the subscription box retail trend in motion with its 2010 launch. Specializing in beauty, grooming and lifestyle products, subscribers pay $10 (for women) or $20 (for men) per month to receive goodies like skin rejuvenators, fragrances and makeup. Now the company has 800,000 active global subscribers, according to company rep Brittany Tomkiewicz—which translates to $96 million in annual sales. Why all the beauty box love? Here are my three reasons why I love Birch Box and why a beauty box may be right for you or a loved one. When life is difficult, a little gift can go a long way. My husband gifted me and our daughter Birch Boxes. Every time I receive one I think of them both and of how much I love them. If money wasn’t a factor, in a heartbeat I would gift these boxes to my dearest friends, both male and female. I would also encourage my friends to consider gifting these to themselves! Getting out of a rut has never been this nice. I’m the least likely candidate to swoon over beauty products. I have spent very little time, energy, or money on such matters. Which means that I have a few go-to products that work. Ho hum. Now, I can spice up my routine with new scents, colors, and textures while investing little energy. Opening up a box, that I can do. The boxes are the bomb. Speaking of the box, I love it. Sometimes I love the box more than anything in it. They are pretty and practical. I like to reuse a box by covering the logo with something decorative, then I fill the it with a little gift or card. Nice and easy. Do you receive a beauty box? Which one? Do you receive and subscription boxes? Which ones? Would you like to receive a box? What stops you? This entry was posted in Family, Friends, Happiness, Lifestyle, Popular Culture, Relationships, Solo and tagged Beauty, Birch Box, Pop Culture, Shopping, subscription box. Bookmark the permalink. Nonsense Karaoke with Chris Pratt because favorite songs become even better when they’re funny. The box is truly cute! Now that I’m all into these boxes, guess what? There are endless boxes! I shouldn’t be surprised. I did a quick search and check out these natural and vegan boxes: http://hellosubscription.com/natural-vegan-beauty-subscription-boxes/ A winning idea is going to find it’s audience. (Now if only I had endless money, haha). I’m a huge fan of Birch Box, but Ipsy’s Glam bag is hands down my favorite. Why? I love that every month rather than a box, I get a cute little themed makeup bag, with its contents matching that theme. I have quite a collection going too. I get to reuse them to store things like my huge collection of lip glosses in my purse, feminine products, nail polishes, the list goes on. I have about 3 makeup products I use on a daily basis, and its fun to switch the makeup bag from time to time. Great post! Now isn’t that interesting to think about not only the products (natural, vegan, top shelf, or…) but thinking about the container they are in! I’m definitely a box gal, goes way back. Are you a bag girl? I am! I collect them..all sizes, shapes & colors. Can never have enough! Speaking of products in the Ipsy bag, I like that they usually include a big brand product, on the pricy side, that I would never spend on for myself let that amount of money makeup, so it makes for a super exciting treat! This is fascinating! Bags drive me crazy! I don’t know how to store them…their handles…the zippers. I’m not sure what this says about me but I’m sure that being a “box girl” isn’t what most gals are shooting for, LOL! Boxes make me nervous. If they aren’t stacked right or even on top of each other…yea, ok I’ll stop there. I get it…the box is more organized, neat, tidy, stackable, orderly. Boxes have come a long way as far as prints, handles, shapes and sizes. Who knew a Birch Box post would bring out so many…feelings!? I’ve never gotten in to them. though they sound like a lot of fun. Beauty boxes, any subscription boxes, can be fun! There are debates about if they are worth the cost, but some things are subjectively worth the cost. Having a little gift come to your home is pretty sweet. ~~~~ waving to you, Ness! Exactly!! Interestingly, I believe that Walmart has a box … https://beautybox.walmart.com/ <- there it is, which is less box pretty. I have never heard of these. What fun it will be to gift myself one of these a month! Thank you for the find Angie. Oh, Aquileana, different countries have different beauty boxes. Do let me know if you gift yourself with one. I would love to know which one you choose! Well “said”! 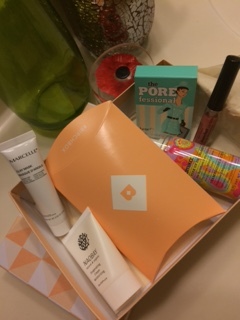 All the same reasons why I’m really digging my Birchbox subscription. Especially since it was a gift from my husband:) I’m not a beauty guru by any means but I do love getting out of my comfort zone with Birchbox products. Definitely a lot of fun!